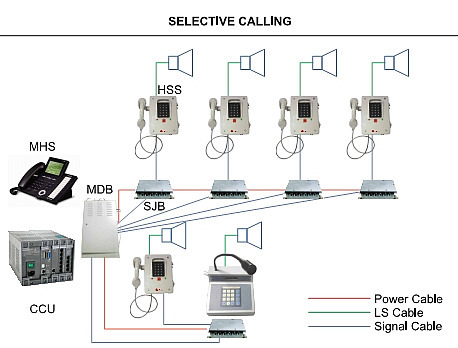 The Microprocessor based selective calling system, designed to meet customized communication requirements in commercial and industrial applications to operate in extreme conditions of industrial, hazardous or marine conditions and there likes. Incorporates many features, made possible by use of digital technology. The system Comprises of a number of stations, located at strategic points, through the Central Control Unit (CCU) using 6-core cable. This permits number of simultaneous communications, in full duplex mode, dependent upon the no. of groups. Communicate with any desired station on selective call basis. Each station has its discreet code number and can be called from any station. The CCU architecture permits 8 independent / simultaneous duplex conversations. The communication chart can be altered, as desired, by programming the exchange; e.g. ; barring certain units from making calls to selected numbers. Alert tone, siren tones, and programmable pre recorded messages. If a selective or direct call is urgent and the called station in busy. The control room has priority "BARGE-IN" facility. Groups can be programmed in the central control unit. When a station is connected to more than one group, access will be on "First - Come -First-Serve" basis. If any station is busy, the calling station can keep the call pending or can "Be- in- queue". While the call is in "Q", it is free to receive incoming calls. Clear voice reproduction with high syllabic articulation, even under adverse acoustic conditions. Dynamic compression of signals from microphone preamplifiers prevents overdrive of amplifiers, resulting in clarity of announcements. fire alarm interface with "evac" message with Modular Card expansion. A caller dials the number assigned for the station, if the called station is free, paging channel is activated automatically, and an alert tone precedes the announcement, heard over external loudspeaker of the called station. The page channel will be active for a prescribed time. If the called party answers the call within this predetermined time, communication automatically shifts to the party line.Up to four stations can be in conference on party channel. The line gets "reset" automatically in case there is no response from the called party. If two stations are engaged in communication, other stations are free to communicate. Central exchange can be programmed to activate Group calls, all call, Siren and other priority function. The system can be programmed to be interfaced with existing Telephone exchange.